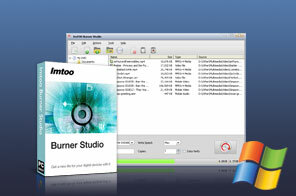 ImTOO Burner Studio, a data CD/DVD burning tool, can easily burn any data, music, videos, image files to CD or DVD. It supports kinds of CD/DVD formats: CD-R, CD-RW, DVD-R, DVD+R, DVD-RW, DVD+RW and DVD+R DL. ImTOO Burner Studio also can make ISO image files from any files and directly open and edit ISO image file. ImTOO Burner Studio is industry-approved CD/DVD burning software which can burn any data like music, videos, and image files to CD or Home DVD discs. It can also backup CD/DVD from one disc to another with high compatibility for kinds of CD/DVD formats: CD-R, CD-RW, DVD-R, DVD+R, DVD-RW, DVD+RW and DVD+R DL. Besides burning data CDs/DVDs, it supports making ISO images from any files on your computer. You can directly open and edit ISO image files, as well as extract files from them to local disk. Data CD/DVD burnerBurn any data like music, audio, ISO image, document on your hard disk to data CDs/DVDs for storage. Create ISO image fileMake ISO image from CD/DVD or any files on your hard disk as an ISO image maker. Copy data CD and DVDImTOO Burner Studio lets you freely copy and backup CD/DVD disc content from one disc to another. Edit ISO image fileAllow you to open ISO image file, freely edit it, and extract files from ISO image file to local disk. Offer two ways to erase disc: quick erasing and full erasing for helping you erase rewritable disc content. Data verification helps you verify written data with source after burning to ensure the usability of written data. Able to adjust write speed, change disc name, select copies of burning disc (up to 100 disc copies one time). The burning process bar enables you to know about time remaining, size and burning percentage. After-done actions: shutdown, exit, hibernate, standby. Provide multiple language interfaces: English, German, Japanese and Chinese. Burn ISO, BIN/CUE, IMG, MDF, DMG, and other image files to DVDs.